HomeMaccaferri is awarded contract to provide MacDrain W geocomposite in a draining project in Macedonia. Maccaferri is awarded contract to provide MacDrain W geocomposite in a draining project in Macedonia. 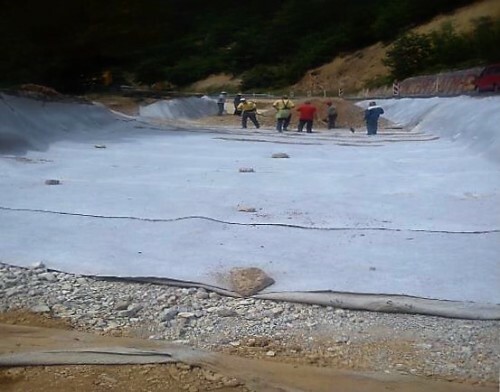 Maccaferri helps rehabilitate a landslide hazard in Taseva cheshma and Botun (Macedonia) using the MacDrain W drainage geocomposite product line. The area surrounding the villages of Taseva cheshma and Botun in Macedonia are subject to frequent large scale terrain erosion caused by regular rainfall. Given the severity of the circumstances, emergency measures had to be taken immediately to mitigate possible dangers. The solution required a simple intervention—the vast excavation of a long trench, within which Maccaferri’s drainage geocomposite MacDrain W 1081 is placed. The total quantity of the work consisted of 3’500m2 of drainage geocomposite to collect and reduce the build up of water from the clay soil slope. Landslides and other related problems were successfully prevented. Maccaferri’s MacDrain W 1081, is a geocomposite for planar drainage (GCD), realized by thermo-bonding a drainage core in extruded monofilaments (GMA) with a nonwoven geotextile on each face to prevent the drainage core being clogged up with fine material in suspension in the water flow. The three-dimensional drainage core has a parallel “W” configuration of longitudinal channels. Maccaferri’s drainage geocomposite range is easy to install and has great functionality; MacDrain W directly replaces the conventional drainage aggregates and collector drains that are usual counter-measures for erosion protection and landslides. The MacDrain W has lab-tested long-term performance, unlike the traditional granular drains which it replaces. Finally, MacDrain W dramatically reduces the amount of quarried gravel materials required by these projects, reducing transportation costs and carbon footprint. Although the project was realized in 2014 by the contractor AD Ilinden Struga, it has recently been revisited and there have been no instances of erosion of landslides on the slope. At the time, the contractor reached out to our distributor in Macedonia (Ergo Kom) for help. The stability and durability of the installed solution ensure that the problem has been resolved indefinitely. While the contractor could have chosen to install a simple large-scale wall or piles to maintain the slope, they recognized the need to eradicate the problem by its roots and not only treat its symptoms. In light of this, they built a drainage system which collects the water within the slope, releasing the existing water pressure and reducing the risk of slippage. The project highlights Maccaferri’s ability to mitigate successfully erosion and landslide risks. Maccaferri’s success can be measured by the clients (Public Enterprise for State Roads) willingness to trust Maccaferri to solve similar problems and other hydraulic and geotechnical complications in using its product lines and solutions.